Seóirse Bodley was born in Dublin in 1933. Studies in Ireland and Germany led to a teaching appointment at University College Dublin, where he was awarded the degree of D. Mus. He is currently Emeritus Professor in the music department there. Influences on his compositions include a range of musical styles from the European avant-garde to Irish traditional music. His works include five symphonies for full orchestra, two chamber symphonies and numerous orchestral, choral, vocal and chamber pieces. The many commissions he has received include his Third Symphony, commissioned for the opening of the National Concert Hall in Dublin, and his Fourth Symphony, commissioned by the Arturo Toscanini Symphony Orchestra of Parma, Italy. In addition to many performances in Ireland, his music has been broadcast and performed in North America, many European countries, Australia and China. Awards include the Arts Council Prize for Composition, a Travelling Studentship of the National University of Ireland, the Macaulay Fellowship in Music Composition and the Marten Toonder Award. In 2008 Seóirse Bodley was elected a Saoi of Aosdána, Ireland’s state-sponsored academy of creative artists. Photograph: David Collier. 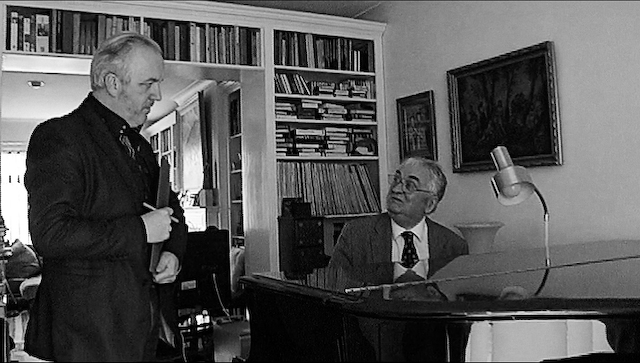 Seóirse Bodley (seated) and Benjamin Dwyer at the composer’s home in Dublin, 23 February 2013.